In the highly populated world of puzzler apps, it takes a lot to stand out and shine, especially if common game themes are used (i.e. color-matching, number crunching, etc.). 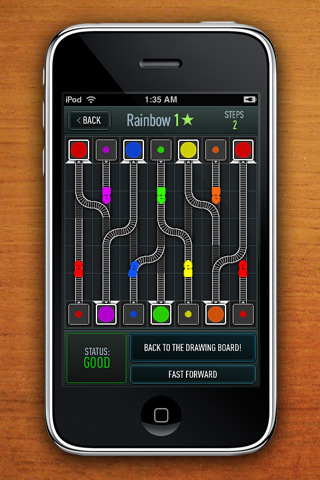 Matt Rix’s new puzzler app, Trainyard, combines line drawing and color matching in a unique and innovative way. The concept is simple: on a grid, use your finger to draw a line from the outlet station (indicated by a “+” symbol) to goal station (indicated by a circle); make sure both symbols are matching in color. And…that’s basically it. It sounds easy enough, but once you start unlocking more and more levels, the routes get progressively convoluted and tricky. One of the curveballs is that there is often more than one color on the field. Sometimes the routes have to cross, especially when you have one goal station for many outlet stations. Each square on the grid can only hold two tracks: an active one and a passive one (darkened). You can double-tap such a track in the planning stages to switch them. After a train has run upon such a square, the tracks will automatically switch. Surprisingly, there are no limits to time or the number of tracks used; in fact, there isn’t even a score, as each level completion only nets you stars to unlock the next level. Another trial is timing, along with a healthy dose of color mixing. You’ll have to plan overlapping routes that will end up with more than one train meeting each other at the same time, thereby reaching the sole corresponding goal station as one. Sometimes this involves two trains of different colors–make sure they’ll mix to match the color of the goal station. If you ever make a mistake (you will), there are three ways to correct it: Erase tracks square by square, Undo, or shake the device to clear the grid. Trainyard is definitely a challenge, although it didn’t seem that way during the first few levels; those are mostly for training and mastering the fundamentals of laying down tracks. At times, it seemed like the tutorial would go on forever, but once you hit the harder levels you’ll be glad for the practice. One of the awesome aspects of this game is that there is no official correct answer for many of the puzzles; you’re welcome to create your own unique solution, and can even post it on a website (and check out other people’s solutions). Everything about this game app is as undistracting and minimalistic as possible: there is no soundtrack, sound effects are quiet and short, and the graphics are mainly composed of a handful of shapes with as many colors, so don’t expect to be dazzled with a lot of flash. The biggest problem I had with Trainyard is with the actual track-laying–there were numerous times when the track I wanted to lay down wouldn’t appear, or would be lain out in a different square than I had planned (curse my large fingers). Other than that, Trainyard is a must-try, and quite an impressive offering from the developer. AppSafari review of Trainyard was written by Julie Guan on July 11th, 2010 and categorized under App Store, Fun, Games, Line Drawing, Puzzler. Page viewed 7312 times, 1 so far today. Need help on using these apps? Please read the Help Page. Love it!! Aside from the addictive game, the fact that the game does not hide the phone’s top bar with the clock is genius! This is typically the kind of game you play in between two appointments, in the train etc. No need to close the game to check the time!